Women's Executive Council of Orlando is an association of executive women who are committed to recognizing and developing women in our community. Women's Executive Council meets on the second Wednesday of each month (excluding December) at 11:30 am the CITRUS CLUB in downtown Orlando. Women's Executive Council of Orlando welcomes this month's guest speaker! 100% of your investment will be awarded to one of our scholarship recipients. Receive your special lapel pin for your contribution! Full scholarship or Giving Circle options available. Throughout the year, Women's Executive Council (WEC) raises money for Women's Executive Council's Scholarship & Endowment Fund through corporate sponsors and direct donations. 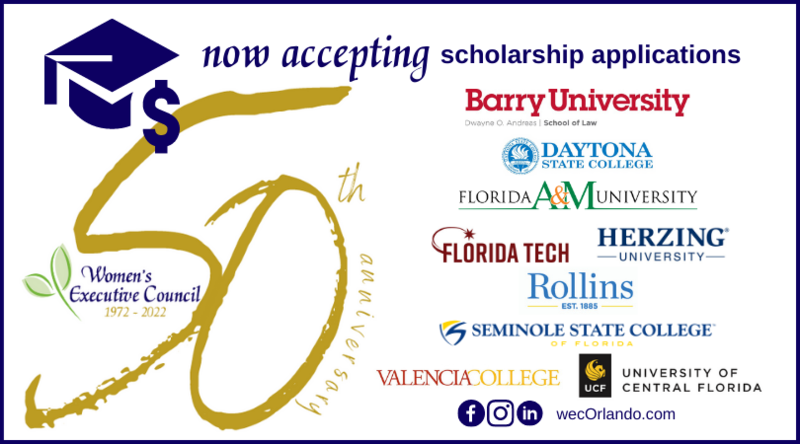 These funds provide scholarships to women attending Valencia Community College, University of Central Florida, Rollins College, Seminole State College, Florida Institute of Technology and Herzing University. Our scholarships have provided a turning point in the lives of the many young women we have embraced. Through our financial support, we have encouraged their personal growth, self-improvement, professional development and leadership skills. Since 1987, the Women's Executive Council has awarded $451,548 in scholarship funds to 277 women in Central Florida. In addition, WEC extends our mission and community outreach to several not-for-profit organizations with annual contributions to assist in funding special projects to help better serve their mission and community. For the past seven years, WEC gave $337,048 to the community in the form of scholarships and annual contributions. Your investment is appreciated to support our 501(c)(3) Women's Executive Council Scholarship & Endowment Fund, Inc.